Permanent hair removal is accomplished by guiding a tiny, ultra-fine probe into the natural opening of the hair follicle. A minute amount of electrical current is passed down the probe to the root of the hair, destroying it. The hair is then gently lifted out, never pulled. 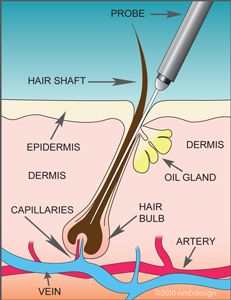 Ultimately, the ability of the follicle to produce a hair is halted. Electrology is always performed in a series of treatments. These treatments are uniquely designed for each person and each area of the body where clear skin is desired. Continuity of treatments is the most important element in achieving successful destruction of the follicle and permanent hair removal.